Wilhelm Wagenfeld (German, 1900-1990), Schott & Genossen / Jenaer Glas (Germany, founded 1884). Teapot designed 1932. Mold and free-blown heat-resistant glass, 4.63 x 10.25 x 6″. Kamm Collection 2000.157. Photo: David H. Ramsey. Wilhelm Wagenfeld is one of the most significant German product designers of the twentieth century. He is known for creating simple practical designs for the average household. Although Wagenfeld thoroughly embraced mass production, he did not believe he had anything to contribute to the “seasonal styling of trends.”[ii] Instead, his timeless everyday products are characterized by their functionalism and understated beauty. Wagenfeld, who had prior training as a silversmith and a draftsman, arrived at the Bauhaus in Weimar, Germany in November of 1923. [iv] He would apprentice in the metal workshop under silversmith Christian Dell and the well-known Hungarian professor, László Moholy-Nagy. However, at the time of his arrival the school’s philosophy was undergoing some changes. At Gropius’ instruction the Bauhaus transformed from “a new guild of craftsmen” to workshops that created prototypes for industrial production. [v] Moholy-Nagy also “stressed objectivity and economy, maximum effect with minimum effort, resulting…in abstract, geometric form.”[vi] Wagenfeld embraced this new directive creating some of the Bauhaus’ most iconic designs. In 1931 Wagenfeld was hired by Schott & Genossen glassworks in Jena, Germany. [vii] The company brought him onboard after he voiced his disapproval that artists were not designing their household products. [viii] Wagenfeld was tasked with revamping Schott & Genossen’s glassware line that utilized laboratory glass usually employed in the creation of beakers and test tubes. As early as the 1910s, the company had determined that their heat and chemical resistant glass was also ideal for kitchen use. [ix] However, the selection of wares they offered was limited. During Wagenfeld’s design process he closely observed the company’s glass makers at work gaining greater knowledge of the material. He then used a “optical gauge to study the tension created in the glass…and was able to develop designs which were largely free of tension in their organic development.”[x] This careful research and consideration resulted in a successful transformation of the glassware line at the company. For the next seven years a range of products followed. Wagenfeld is credited for not only energizing sales, but also the culture of Schott & Genossen by helping them hire additional designers such as Moholy-Nagy who was recruited for advertising. One of the most important Schott & Genossen forms was a delicate bubble-like teapot. 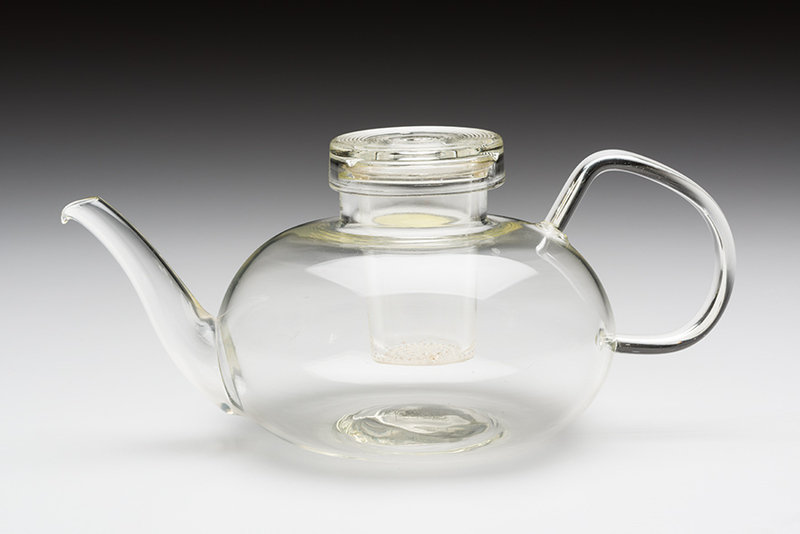 More than any other design, this teapot effectively exploited the transparency of the material. Fresh and elegant, its impact was far-reaching. The Kamm Teapot Foundation has one of these distinctive Schott & Genossen teapots and an accompanying service in its collection. Although the primary focus here is on the teapot, the six-person set also contains a sugar bowl, a creamer, cups, saucers, plates, and a tray. This short spherical teapot has a tapered slightly curved spout and a delicate looping handle. Visibly extending down into the body of the structure, is a cylindrical strainer. On the top of the strainer rests a flat circular lid. The set’s creamer and sugar bowl are built in a similar manner as the teapot, but with more hemispherical forms. A key to Wagenfeld’s success, at companies such as Schott & Genossen, was his understanding of the importance of product placement and advertising. For example, he would introduce his products, like his glassware, in training kitchens. By doing this he knew that trainee chefs and waitresses were more likely to buy the designs for work or home. However, in advertisements his products were often shown in everyday settings. A black and white advertisement from 1934 stated, “Everything tastes better from a Jena glass.”[xi] It featured a nicely dressed father with a charming smile and his two small children. [xii] Advertisements, such as this one, intentionally placed these minimalist designs in familiar environments in hopes of garnering greater widespread acceptance. Throughout his career Wagenfeld continued to share his knowledge in numerous teaching appointments and consulting positions. His list of accomplishments is extensive, and his influence is widespread. In 1957 Wagenfeld was awarded the Grand Prix at the Milan Triennale, an honor that celebrated his life’s work. Today many of Wilhelm Wagenfeld’s creations are still being produced. Like the Schott & Genossen teapot, these timeless designs continue to be admired for their functionality and modern elegance. Heskett, John. Industrial Design. (London: Thames & Hudson 1980), 101. Manske, Beate, ed. Wilhelm Wagenfeld (1900-1990) (Ostfildern-Ruit: Hatje Cantz, 2000), 10. Marcus, George H. Functionalist Design, An Ongoing History. (Munich and New York: Prestel-Verlag, 1995), 57. [i] Beate Manske, ed., Wilhelm Wagenfeld (1900-1990) (Ostfildern-Ruit: Hatje Cantz, 2000) 10. [iii] Elaine Hochman, Bauhaus: Crucible of Modernism (New York: Fromm International, 1997) 1. [iv] The Bauhaus relocated to Dessau, Germany in 1925 followed by Berlin in 1932. [v] George H. Marcus, Functionalist Design, An Ongoing History (Munich and New York: Prestel-Verlag, 1995) 57. [vi] John Heskett, Industrial Design (London: Thames & Hudson 1980) 101. [vii] In 1884 the glass chemist Otto Schott partnered with Ernst Abbe, Carl Zeiss, and his son Roderich Zeiss. They founded the Glastechnisches Laboratorium Schott & Genossen, which would later become Jenaer Glaswerke Schott & Genossen and then Schott AG. World War II caused the glassworks split apart. Jena was now in Soviet East Germany, but because many engineers and scientists were relocated to Mainz, West Germany another factory was built there. For decades, both factories produced many of the same designs. With the fall of the Berlin Wall in 1989, the two reconnected. The company rebranded itself in the 1990s as Jenaer Glas now a licensee of Zwiesel Kristallglas. Other names associated with the Schott & Genossen include Mainz Schott, Jena Glas, Schott Glas, Saale Glas, and Schott & Gen.